Chinese New Year celebration is one of the good times when we can share happiness to our family especially in this Monkey year, a year that symbolizes young spirit, playfulness, and energetic nature. Pullman Jakarta Central Park celebrates it with an extravagant dinner set and entertainment. Will be held in the Pullman Central Park Ballroom, 2016’s Chinese New Year event is going to be the biggest Chinese New Year event Pullman Jakarta Central Park ever organized. “Last year, we held it at Collage Restaurant of Pullman Central Park and it was a fine celebration. However, it has to be a marvellous event this year. We decide to use the bigger room so that it can accommodate 88-100 tables for our diners,” said Assistant Director of Marketing & E-Commerce Pullman Jakarta Central Park Rita Elisabeth. This dinner will be hosted on February 7th of 2016 from 18.00 until finished. The 9-course menu will be available in three packages. An individual package costs Rp888,000, a table for 8 persons is priced at Rp6,888,000, and a table for 10 persons is priced at Rp7,888,888. The most important menu of this event is an icon of Chinese New Year, Deluxed Salmon and Yellow Fin Tuna Yee Sang. This dish symbolizes prosperity and abundance since Yee Sang that literally means fish shares homophone with Yee Sang that means abundance. This particular yee sang is made from fresh slices of raw salmon, raw yellow fin tuna, shredded vegetables, and sauces. As appetizers, Pullman Central Park serves Pullman Cold Cut Combination. This appetizer plate consists of Sweets Chili Marinating Jelly Fish, Poached Lobster Salad with Fruit, Chilled Baby Octopus with White Sesame Seed, and Charcoal Grilled Honey Pork Cha Siew. If you like something warm, tasty, and healthy as well, this menu is the one to savour: The Buddha Jumps over the Wall Soup or Double Boiled Chicken Soup with Hoisom, Fish Mau, Sliced Abalone Clam, and Chinese Herb. Chinese herb is believed to be one of the most powerful medicinal food and they taste fine as well. This bowl of soup contains angcho or red date, waisan, and tangkue herbs that keep your body warm. It also complements the taste of seafood and chicken. Duck lover is also indulged by a plate of Roasted Duck Hong Kong Style with Hoisin and Plum Sauce. The duck is crispy on the outside and moist in the inside. The savoury meat and its sweet sauce complement each other. It is not Chinese Food when there is no black pepper sauce, indeed. This sauce tastes even better when combined with high quality ingredients. In this dinner set, black pepper sauce is paired with high quality Mulwarra beef in Wok Fried Mulwara Beef Tenderloin with Onion, Capsicum and Honey Black Pepper Sauce. The cubed beef is cooked not very long so that it left the juicy texture in the meat that is quite contrast with the texture of crunchy capsicum and onion. For a lighter option, there is Steamed Live Garoupa with Leek, Chili and Superior Ginger Soya Sauce. 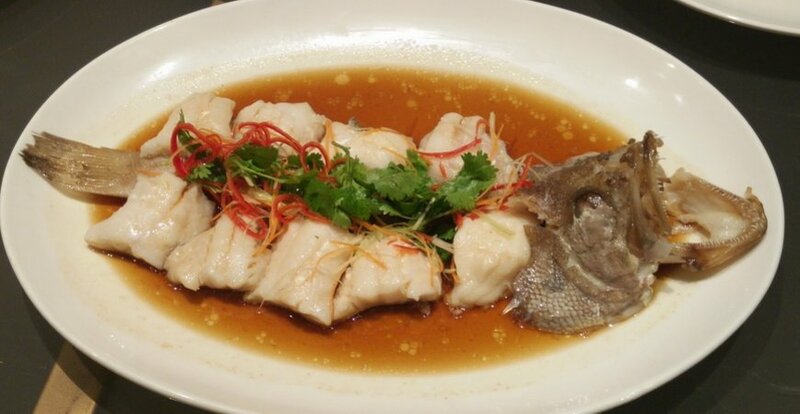 The fresh grouper holds its form when it is steamed and becomes very soft and fluffy, makes the light ginger and soya sauce absorbed into the meat and gives subtle salty and herby flavour. Do not worry if you are a vegetable lover. Stir Fried Broccoli with Scallops and X.O. Sauce is for you. The broccolis are still crunchy while the scallops are as soft as butter. The flavourful X.O. sauce also elevates this dish to another level. Enjoy all the dishes with a plate of Wok Fried Fragrant Rice with King Prawn and BBQ Pork Belly. A plate of comforting fried rice is combined with succulent prawn and tangy pork belly will complete your dinner as it makes you full and satisfied. After the feast, finish your dinner with this fruity desserts series, Mango Pudding, Chilled Lychee & White Fungus and Berry Coulis. To refresh you up, Tropical Assorted Sliced Fresh Fruit Platter will also be served in every table. A full night entertainment will also be provided in this feast night. Before the dinner, guests can have some canapés, capture this moment on the photo booth, try their luck on lucky tree and fortune teller, and listening to the beautiful melody of Gu Zheng or Chinese Harp. While enjoying the sumptuous dinner, guests will be entertained with Chinese opera, Chinese dances such as 1000 hands dance and bou tian dance. A feng shui master will also give a talk show about this year’s luck. After that, Pullman Jakarta Central Park will present barongsai or Lion Dance performed by a certified Lion Dancer group. Traditional live Chinese musical performance will also complete this celebration. Reservation must be made one week before the event and there will be 20% early bird discount for reservations made before January 24th. For inquiries and reservations, dial to +62 21 29 20 00 88 ext. 3001 or shoot an e-mail to H7536-FB4@accor.com.